I was excited about starting this book, when I read the blurb I thought it was a new urban fantasy series that I was delving into. But, as I started to read, I realised it was actually romantic suspense. Which was fine, I don’t read much romantic suspense so I was pleased that a book in that genre intrigued me. 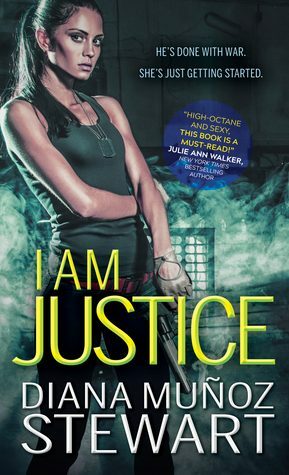 It quickly became apparent that the promise in the blurb of I Am Justice wasn’t fulfilled in the book. Which, was why I DNFed it. I’ll keep this fairly short as I didn’t get that far through it before I was too exasperated with it to continue. The main issue I had with this was the writing. It was clumsy and distracting. For example, Justice refers to people as humans, in such a way that it seemed to imply that she is not human. I spent most my time reading fully expecting a paranormal element to be revealed to explain this extremely weird phrasing. Although, perhaps I am judging too early and beyond the point that I stopped reading something is revealed. But I doubt it. Another point, is that the whole thing was so very cliché and cheesy. I felt like just from reading the first few chapters I could map out the entire story. Admittedly you could say that about virtually any romance book, however, there was nothing within I Am Justice that made me want to continue on anyway and enjoy the ride through well-travelled territory. Despite having an interesting premise behind the book and I assume the series, unfortunately it wasn’t executed in such a way that I could complete the book. That stinks as this did sound promising. No, you’re right. The ‘human’ thing was an affectation. I struggled with this one, too, and I got to the end. My big gripe was that the book told me Justice was this super skilled black ops like operator and yet half the time she was going off half-cocked and making poor decisions that someone trained like that would never do. And… instalove. So, it had some neat parts, but you didn’t miss much. Bumer. I was really looking forward to this one. I almost bought it a few days ago but decides to go for another historical romance 😄😉 Thanks for saving me a few bucks! That’s too bad it wasn’t a good read,the cover was pretty cool. Ty suzanne for your review. Shared on all my socials!